The urbanization is becoming inevitable across the globe and for one of the fastest growing cities, Surat, the status is reported to be alarming. Faster growth of population and settlement with an increase in enterprise establishments generating opportunities are acting as counter magnets in the case of Surat. The city has a natural advantage by means of a perennial flowing river, Tapi, carrying fresh water to match the requirements posed by the citizens for domestic as well other usages. Keeping the environmental concerns at the central thought around urbanization in Surat, the chapter explores through the extent of development and resulting effects. Objectives for the study were set to understand different aspects and chalk out smarter proposals for governance of environmental resources through promoting sustainable practices. Keeping aware of the natural resources utilized or mobilized in terms of quantity and quality is considered a manner towards sustainable use. 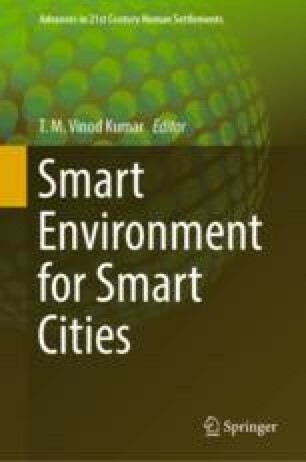 The chapter discusses the situation in Surat regarding the demographics, weather, natural drainage and topography, irrigation and agricultural activities, transport and linkages along with vehicle growth, air quality, water resources, vegetation cover and, industrial activities as drivers of the economy for the citizens. Further, an exploration of the state of essential service infrastructure of water supply, sewerage, solid waste and aquaculture is discussed. Keeping various activities pertaining to environmental concern, the role and challenges faced by various government agencies are deliberated. The concluding remarks are drawn identifying some of the critical concerns and alternative solutions towards smarter governance by adopting technological advances and reforming ongoing practice is recommended. The use of GNSS based solutions is emphasised for various purpose of monitoring and positioning considering the era when there is a maximum number of satellites available for fetching GNSS signals in the space above South-Asia. Employing and promoting the use of interoperability of various positioning satellite constellations through RTK solutions are briefly discussed.